Howlin' Wolf Records: SIX STRINGS: POP QUIZ.... FAVORITE HORROR SCORE? Mysterious deaths surround an American ambassador. Could the child that he is raising actually be the anti-christ? The devil's own son? 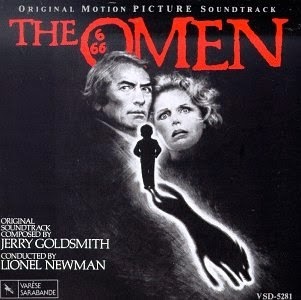 An original score for the film, including the movie's theme song "Ave Satani," was composed by Jerry Goldsmith, for which he received the only Oscar of his long career. The score features a strong choral segment, with a foreboding Latin chant. The refrain to the chant is, "Sanguis bibimus, corpus edimus, tolle corpus Satani" (ungrammatical Latin for, "We drink the blood, we eat the flesh, raise the body of Satan"; note that the correct Latin would be, "Sanguinem bibimus, corpus edimus, tolle corpus Satani"), interspersed with cries of "Ave Satani!" and "Ave Versus Christus" (Latin, "Hail, Satan!" and "Hail, Antichrist!"). Aside from the choral work, the score includes lyrical themes portraying the pleasant home life of the Thorn family, which are contrasted with the more disturbing scenes of the family's confrontation with evil. Not sure I have a favorite horror score. Does Jaws count?